Guides you through all annotations supported in Spring 2.5, covering Core Spring Annotations, Spring MVC Annotations, and more. From its beginning, Spring's most common means of configuration has been XML-based. But as developers grow weary of navigating through a seemingly endless maze of angle-brackets, some have started looking for other ways to wire the beans in their Spring-enabled applications. Spring has responded with several annotation-driven configuration options. 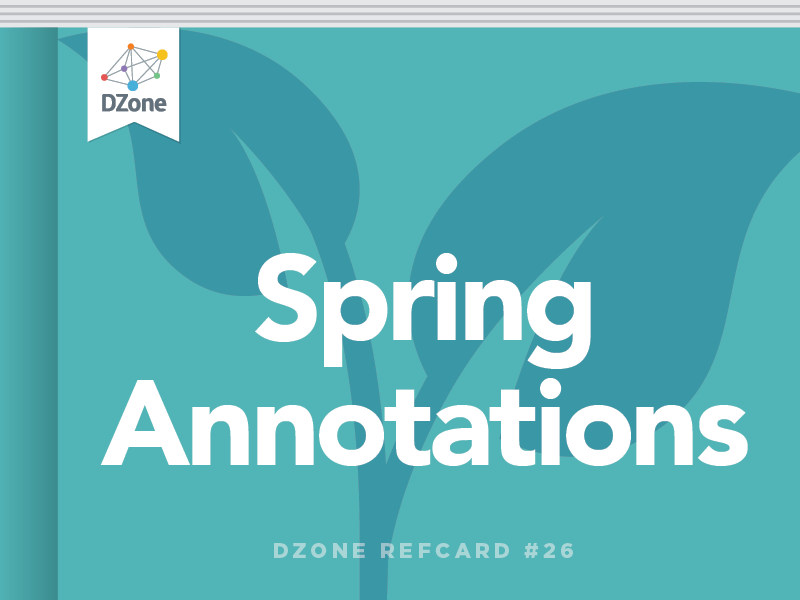 In this reference card, you'll find a guide to all of the annotations supported in Spring 2.5. These annotations are used by Spring to guide creation and injection of beans. @Autowired Constructor, Field, Method Declares a constructor, field, setter method, or configuration method to be autowired by type. Items annotated with @Autowired do not have to be public. @Configurable Type Used with <context:springconfigured> to declare types whose properties should be injected, even if they are not instantiated by Spring. Typically used to inject the properties of domain objects. @Order Type, Method, Field Defines ordering, as an alternative to implementing the org. springframework.core.Ordered interface. @Qualifier Field, Parameter, Type, Annotation Type Guides autowiring to be performed by means other than by type. @Required Method (setters) Specifies that a particular property must be injected or else the configuration will fail. @Scope Type Specifies the scope of a bean, either singleton, prototype, request, session, or some custom scope. ...then the "treasureMap" property will be automatically injected with a reference to a bean whose type is assignable to TreasureMap (in this case, the bean whose ID is "treasureMap"). To resolve any autowiring ambiguity, use the @Qualifier attribute with @Autowired. In this case, the "treasureMap" property must be injected or else Spring will throw a BeanInitializationException and context creation will fail. These annotations are used to stereotype classes with regard to the application tier that they belong to. Classes that are annotated with one of these annotations will automatically be registered in the Spring application context if <context:component-scan> is in the Spring XML configuration. In addition, if a PersistenceExceptionTranslationPostProcessor is configured in Spring, any bean annotated with @Repository will have SQLExceptions thrown from its methods translated into one of Spring's unchecked DataAccessExceptions. @Component Type Generic stereotype annotation for any Spring-managed component. @Controller Type Stereotypes a component as a Spring MVC controller. @Repository Type Stereotypes a component as a repository. Also indicates that SQLExceptions thrown from the component's methods should be translated into Spring DataAccessExceptions. @Service Type Stereotypes a component as a service. The base-package annotation tells Spring to scan com.habuma. pirates and all of its subpackages for beans to automatically register. You can specify a name for the bean by passing it as the value of @Component. This specifies that the pirate bean be scoped as a prototype bean. In this case, the @MyComponent custom annotation has been added to the list of annotations that are scanned for, but @Component has been excluded (that is, @Componentannotated classes will no longer be autoregistered). These annotations were introduced in Spring 2.5 to make it easier to create Spring MVC applications with minimal XML configuration and without extending one of the many implementations of the Controller interface. @InitBinder Method Annotates a method that customizes data binding. @RequestMapping Method, Type Maps a URL pattern and/or HTTP method to a method or controller type. @RequestParam Parameter Binds a request parameter to a method parameter. @SessionAttributes Type Specifies that a model attribute should be stored in the session. In addition to autoregistering @Component-annotated beans, <context:component-scan> also autoregisters beans that are annotated with @Controller. We'll see a few examples of @Controller-annotated classes in a moment. Use a conventions-based view resolver. If you use a conventions-based view resolver, such as Spring's UrlBasedViewResolver or InternalResourceViewResolver, along with <context:component-scan> and <context:annotation-config>, you can grow your application indefinitely without ever touching the Spring XML again. There are several important things to point out here. First, the HomePage class is annotated with @Controller so that it will be autoregistered as a bean by <context:component-scan>. It is also annotated with @RequestMapping, indicating that this controller will respond to requests for "/home.htm". Within the class, the showHomePage() method is also annotated with @RequestMapping. In this case, @RequestMapping indicates that HTTP GET requests to "/home.htm" will be handled by the showHomePage() method. Here the @RequestMapping annotation is applied to two different methods. The setupForm() method is annotated to handle HTTP GET requests while the addPirate() method will handle HTTP POST requests. Meanwhile, the @ModelAttribute is also pulling double duty by populating the model with a new instance of Pirate before the form is displayed and then pulling the Pirate from the model so that it can be given to addPirate() for processing. The @Transactional annotation is used along with the <tx:annotation-driven> element to declare transactional boundaries and rules as class and method metadata in Java. @Transactional Method, Type Declares transactional boundaries and rules on a bean and/or its methods. At the class level, @Transactional is declaring that all methods should support transactions and be read-only. But, at the method-level, @Transactional declares that the storeTreasure() method requires a transaction and is not read-only. Note that for transactions to be applied to @Transactionalannotated classes, those classes must be wired as beans in Spring. These annotations, used with the <context:mbean-export> element, declare bean methods and properties as MBean operations and attributes. @ManagedAttribute Method Used on a setter or getter method to indicate that the bean's property should be exposed as a MBean attribute. @ManagedNotification Type Indicates a JMX notification emitted by a bean. @ManagedNotifications Type Indicates the JMX notifications emitted by a bean. @ManagedOperation Method Specifies that a method should be exposed as a MBean operation. @ManagedOperationParameter Method Used to provide a description for an operation parameter. @ManagedOperationParameters Method Provides descriptions for one or more operation parameters. @ManagedResource Type Specifies that all instances of a class should be exposed a MBeans. Here, the PirateService has been annotated to be exported as a MBean and its getPirateList() method is a managed operation. For defining aspects, Spring leverages the set of annotations provided by AspectJ. @Aspect Type Declares a class to be an aspect. @After Method Declares a method to be called after a pointcut completes. @AfterReturning Method Declares a method to be called after a pointcut returns successfully. @AfterThrowing Method Declares a method to be called after a pointcut throws an exception. @Around Method Declares a method that will wrap the pointcut. @Before Method Declares a method to be called before proceeding to the pointcut. @DeclareParents Static Field Declares that matching types should be given new parents,that is, it introduces new functionality into matching types. @Pointcut Method Declares an empty method as a pointcut placeholder method. What's important to note, however, is that while you can use AspectJ annotations to define Spring aspects, those aspects will be defined in the context of Spring AOP and will not be handled by the AspectJ runtime. This is significant because Spring AOP is limited to proxying method invocations and does not provide for the more exotic pointcuts (constructor interception, field interception, etc.) offered by AspectJ. Note the rather odd looking plunderPC() method. It is annotated with @Pointcut to indicate that this method is a pointcut placeholder. The key thing here is that the most interesting stuff happens in the annotation itself and not in the method. In fact, pointcut placeholder methods must be empty methods and return void. In addition to Spring's own set of annotations, Spring also supports a few of the annotations defined by JSR-250, which is the basis for the annotations used in EJB 3. @PostConstruct Method Indicates a method to be invoked after a bean has been created and dependency injection is complete. Used to perform any initialization work necessary. @PreDestroy Method Indicates a method to be invoked just before a bean is removed from the Spring context. Used to perform any cleanup work necessary. @Resource Method, Field Indicates that a method or field should be injected with a named resource (by default, another bean). As annotated, the wakeUp() method will be invoked just after Spring instantiates the bean and goAway() will be invoked just before the bean is removed from the Spring container. These annotations are useful for creating unit tests in the JUnit 4 style that depend on Spring beans and/or require a transactional context. @AfterTransaction Method Used to identify a method to be invoked after a transaction has completed. @BeforeTransaction Method Used to identify a method to be invoked before a transaction starts. @ContextConfiguration Type Configures a Spring application context for a test. @DirtiesContext Method Indicates that a method dirties the Spring container and thus it must be rebuilt after the test completes. @ExpectedException Method Indicates that the test method is expected to throw a specific exception. The test will fail if the exception is not thrown. @IfProfileValue Type, Method Indicates that the test class or method is enabled for a specific profile configuration. @NotTransactional Method Indicates that a test method must not execute in a transactional context. @ProfileValueSourceConfiguration Type Identifies an implementation of a profile value source. The absence of this annotation will cause profile values to be loaded from system properties. @Repeat Method Indicates that the test method must be repeated a specific number of times. @Rollback Method Specifies whether or not the transaction for the annotated method should be rolled back or not. @TestExecutionListeners Type Identifies zero or more test execution listeners for a test class. @Timed Method Specifies a time limit for the test method. If the test does not complete before the time has expired, the test will fail. @TransactionConfiguration Type Configures test classes for transactions, specifying the transaction manager and/or the default rollback rule for all test methods in a test class. In this case, the pirate and treasureMap properties will be wired with the beans whose ID are "pirate" and "treasureMap", respectively. There are several important things to point out here. First, the HomePage class is annotated with @Controller so that it will be autoregistered as a bean by <context:component-scan>. It is also annotated with @RequestMapping, indicating that this controller will respond to requests for \"/home.htm\". Within the class, the showHomePage() method is also annotated with @RequestMapping. In this case, @RequestMapping indicates that HTTP GET requests to \"/home.htm\" will be handled by the showHomePage() method. In this case, the pirate and treasureMap properties will be wired with the beans whose ID are \"pirate\" and \"treasureMap\", respectively.